The DTC1250e provides an ideal card printing solution for small businesses, schools, and local governments that need a simple, reliable, and affordable means of printing and encoding photo ID cards. You get professional quality, color ID cards and security encoding reliably all in one pass. Operation and supply replacement are both intuitive, making training completely unnecessary. With a small, compact footprint, both single and dual-sided options, a simple user-focused design, and easy integration with other HID products, you'll receive maximum value from the most trusted name in secure identity solutions. 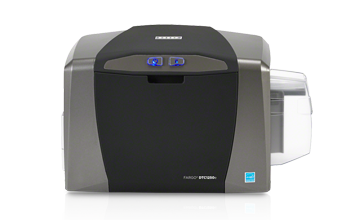 The DTC1250e printer/encoder was created to be easy to use in a variety of office environments. Operation is simple, cartridge supplies make maintenance easy, and includes SwiftID, which uses your web browser to help you create custom badge designs--without an additional printer driver. The DTC1250e can be built to your specific needs. Choose the dual-sided printing option. Choose magnetic stripe encoding. And depending on the readers you use, you can choose 125 kHz, 13.56 MHz, or contact chip encoding. Also available with USB or Ethernet connectivity. Smart design plus configuration flexibility gives you a simple ID card printer that does exactly what you want it to do, with no training, easy supply replacement, and no additional software required. With its small footprint, its compact size was designed for the smallest of desks or tables. With cartridge supplies and easy card reloading, the DTC1250e was made for organizations that need a secure ID card solution without having to commit a lot of room for equipment. 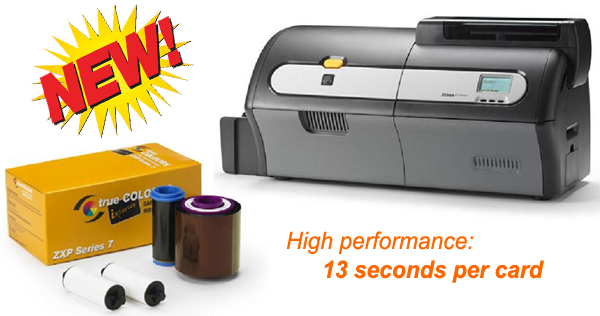 We back our Direct-to-Card Printer/Encoders with a global 3 years warranty. Each of our 7th generation Fargo printers now works seamlessly with HID readers and other asset protection modules.